HWR: will bus-only lanes rise again? 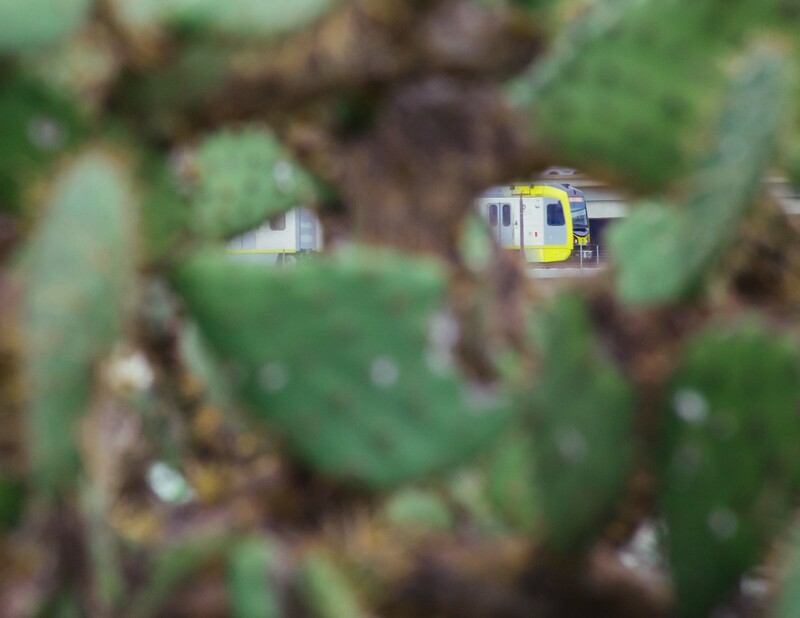 A test train on the Gold Line extension to Azusa as seen through a cactus growing along the San Gabriel River. Photo by Steve Hymon/Metro. When @metrolosangeles keeps the doors of your expo train closed to keep everyone warm before the scheduled departure time. #thankyoumetro ! Reminder: make sure to follow @metrolaalerts on Twitter for dedicated service alerts! More info here. Metro also issued a news release today about the initiative. I put it at the bottom of this post. Garcetti needs to improve transit options, and fast. More specifically, he needs to focus on improving bus service as a more feasible and less costly alternative to rail expansion. After all, for $31.5 million the city can create a new bus lane in about a year, while the proposed Purple Line Subway expansion will take about 10 years and $100 million to complete. Adding dedicated bus lanes will go a long way toward solving two of the principal problems with LA bus service, and the reason why many people opt to drive themselves: slow service and unreliable schedules. After all, people aren’t too inclined to use transportation that will pick them up 10 minutes late and make them miss their transit connection. Attentive Source readers know that bus-only lanes tend to be a tough sell — or there would be more of them. Taking a general traffic lane or even a parking lane usually meets some resistance from motorists, residents and business owners. Which means that bus-only lanes, in turn, often meet resistance at your local city hall. Remember when Metro was trying to implement the Wilshire peak hour bus lanes? Residents along Wilshire between UCLA and B.H. were successful in getting rid of the bus lane in their neck of the woods. Neither Beverly Hills or Santa Monica were involved in the project, mostly because the project was originally envisioned as something only the city of L.A.’s portion of Wilshire. That’s not to say BOLs are impossible — you do seem them here and there. You also seem them more in countries not called the United States. The traditional knock on buses is that they have to stop for traffic, traffic signals and to pick up and drop off passengers — meaning they have a hard time competing speed-wise with your average motorist. A plethora of transpo officials have talked up BOLs over the years (more often using the term bus rapid transit or BRT), pointing to their reduced cause. But outside transit circles, I’m not sure their arguments have gained much traction. That said, a few projects manage to secure federal funding each year and the Federal Transit Administration has let it be known it thinks BOLs and BRT is a wise investment of taxpayer dollars. The Operation Shovel Ready list above includes a trio of projects that could result in bus lanes — the East San Fernando Transit Corridor (some folks want it to be rail), Vermont Avenue BRT and NoHo to Pasadena BRT. One note: The third segment of the Purple Line Extension between Century City and Westwood will cost significantly more than $100 million. It will also have greater capacity and speed than a bus and connect two key job centers — Westwood and Century City — to downtown Beverly Hills, the Miracle Mile, K-Town, Westlake, Hollywood, NoHo and DTLA. Booyah! With Metro set to launch bike share in DTLA this summer, LAist’s Matt Tinoco is more optimistic about bike share than the dude in the LAT’s op-ed pages last week. Matt points to our great weather, oft-flat topography, many streets that are safe for biking and Metro’s ability to help cyclists cover long-distances. As for the all-star game, Go Metro! The Blue and Expo Lines’ Pico Station is just a few steps from Staples Center. You’ve probably never heard of the Kariba Dam in Zambia. Yet another reminder from the Dept. of Infrastructure that it’s one thing to build it, it’s another to maintain it. The consequences of the dam falling are dire. The Old Gray Lady discovers that if the game is really exciting, more people are inside watching than outside taking taxis. Fascinating. Also, Beyonce drove down taxi usage in Gotham when she delivered her half-time performance. In an action to move major rail, bus and highway projects closer to implementation, the Los Angeles County Metropolitan Transportation Authority (LA Metro) announced today a strategy to aggressively accelerate projects to help bring them to a “shovel-ready” state. Operation Shovel Ready anticipates potential grants, private sector participation and local community support that can help fund major infrastructure improvements already identified for L.A. County. Operation Shovel Ready specifies that any projects slated to move forward do so only with work that would be necessary even if the projects do not immediately receive funding for design and construction. In addition, funds needed to advance shovel-ready projects would not impact funding for currently approved projects. “Experience shows that aggressively moving forward is more likely to advance projects quicker toward completion. Many transportation agencies have moved projects through planning before complete funding commitments are received and have ultimately been successful,” said LA Metro CEO Phillip A. Washington. Operation Shovel Ready highway transit projects are identified at www.metro.net/projects. 31. 5 million to build bus only lanes? Are they using white paint imbedded with gold to delineate the bus lanes? And what is so new about this concept on Wilshire Bl? They tried it before and abandoned the effort when it failed. It was a lot more than signs and painted lanes. Wilshire was completely rebuilt near the VA with an extra east bound lane. Also, it was repaved and they had to rebuild the curb lanes in some cases. I doubt bus lanes go anywhere. The Wilshire lanes haven’t increased ridership and there is a lot of opposition to them. Even people that are for them see cars going in them with no enforcement. As to the raccoon, if he paid his fare, he should be allowed to ride, the same as any human. Not quite sure what the fare is for a raccoon, though. Or where raccoons carry their money and transit passes. What happened to Foothill Gold Line Phase 2B? Why is it not on the list of “Shovel-Ready” projects? If anyone wants BOLs to work they need some type of physical separation and tons of enforcement either by police or cameras who can ticket. Wilshire BRT lanes are just a suggestion for the road raging drivers, the LAPD has done no enforcement and due to Purple Line construction they opened the lanes then scrubbed the “BUS LANE” markings from the ground less than 6 months later. Billions gets spent on light rail thru low density LA while the 60k riders a day wait behind 2 people turning right on Wilshire blvd. Why is the measure R green line expansion so small? There is so much room for expansion with this line.